Click on any of the above page names to go to that page. These are links that the reader might find of interest to the model engineering community or were passed on during some of our 'Bits and Pieces' seminars. If there is any link that might be a beneficial to add, is in error, is out-of-date or broken, please contact the web master. the community of Valyermo. Owner is Bill Semerau. "A visit here is a journey back to the time of the 1850s Patterson Ranch--a prosperous, 19th-century country estate with a beautiful Victorian mansion and elaborate Victorian Gardens." A full size Porter locomotive runs on the farm. Located in Old Sacramento, the California State Railroad Museum is a complex of historic facilities and unique attractions. Widely regarded as North America's most popular railroad museum, there is something here for everyone! Throughout the year, experience lavishly restored trains, engaging exhibits, and unique special events. Every weekend April-September, ride behind a real locomotive! A site dedicated to enthusiast of all skill levels and disciplines of the metal working hobby. Jim House visited the massive Allegheny mallet (2-6-6-2). It was slightly slightly elevated which allowed the locomotive to be motorized and show the motions of the locomotive running gear. "The SS Jeremiah O'Brien is one of two remaining fully functional Liberty ships of the 2,710 built and launched during World War II. The O'Brien has the distinction of being the last unaltered Liberty ship and remains historically accurate. Moored at Pier 45, Fisherman's Wharf, she is a premier San Francisco attraction." The Knight Foundry, set in the heart of Sutter Creek, is America’s last water-powered foundry and machine shop. Established in 1873 by Samuel Knight, this extraordinary facility includes the unique historic equipment and machinery, still in place in its original context, just as it was during its gold rush-era heyday. 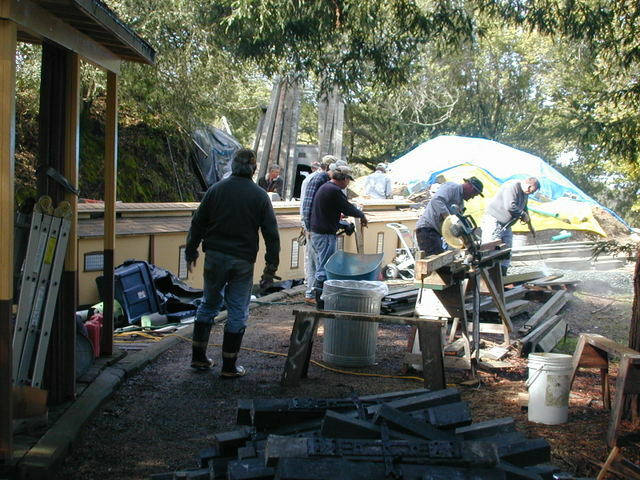 Knight Foundry is nationally recognized as a National Historic Mechanical Engineering Landmark and a California Registered Historical Landmark. The Foundry is listed on the National Register of Historic Places and has been named by the National Trust for Historic Preservation as one of America’s eleven most endangered historic places. The USS Midway Museum is a 501(c)3 non profit organization established in 1992 to preserve the historic USS Midway and the legacy of those who served, inspire and educate future generations and entertain our museum guests. Recommended by Mark Johnson, he highly enjoyed looking at the captured U505 German submarine housed within. The Napa Valley Wine Train provides a relaxing three-hour, thirty-six mile round-trip journey from the historic town of Napa, through one of the world's most well known wine valleys to the quaint village of St. Helena, and back. The 'Never Come, Never Go' narrow gauge railroad was a 22-mile connection between Nevada City and Colfax, California in the gold country of California. Visitors are offered a docent-lead historical tour of the museum, rail yard and restoration shop. The Pacific Locomotive Association, Inc. operates the Niles Canyon Railway as a living history museum interpreting the importance of our heritage railroads in the development of California and the nation. "This historic site includes a fascinating exhibit of hundreds of Sierra Nevada gold mining artifacts, including a working Stamp Mill and Cornish Pump, the largest Pelton Wheel ever constructed." Rail Excursions Await - The Redwood Forest Steam Train and the Santa Cruz Beach Train. The Railroad Museum of Pennsylvania houses one of the most significant collections of historic railroad artifacts in the world. "The Historic Sierra Railroad Shops and Roundhouse complex at Railtown 1897 State Historic Park in Jamestown is one of a very few survivors of its kind in North America." Welcome to SS Red Oak Victory, the historical World War II cargo Ship owned and maintained by the Richmond Museum of History. Just minutes from Eureka, California, the Samoa Cookhouse, the last surviving cookhouse in the West, continues the tradition of serving lots of good food, lumber camp style! After a hearty meal, take a step back in time; Visit the Historic Logging Museum and gift shop full of relics and photographs from the old logging and Cookhouse days. The San Leandro Historical Railway Society (SLHRS) is housed in the San Leandro depot which was built in 1898 by the Southern Pacific Railroad to replace the original depot built by the Central Pacific Railroad in 1865. Construction of the HO scale model railroad display began in 1991. As with most model railroad displays, there is always more work to do. Per the National Model Railroad Association (NMRA) Kalmbach Memorial Library, the SLHRS has the largest HO scale helix in the United States both in height and in diameter. The tourism aspect of this railway feature the Sierra Dinner Train, the Sacramento River Train, the Skunk Train and the unique Zombie hunting Train. One of the Most Scenic Railroads in North America, trips are offered from our two stations located at opposite ends of our railroad line in Fort Bragg and Willits. Sturgeon's Mill Restoration Porject is a non profit organization to restore what is considered on of the last great saw mills of its kind since 1914. The railroad is located on the beautiful 3200-acre Swanton Pacific Ranch in Santa Cruz County. The rolling stock consists of 3 one-third scale Pacific-type steam locomotives built for the 1915 Panama-Pacific Exposition and a diesel switcher. A marveleous 15" gauge private railroad that boasts 4 1/2" miles of track laid at a 4% grade that has 2 cureved trestles, a bridge, a long concrete tunnel and a 2-stall engine house. Nevada’s most famous short line, the Virginia & Truckee Railroad connects Carson City, Virginia City and Minden. An exciting 4-mile railroad excursion at Yosemites Park's South gate on highway 41. Ride into history where powerful locomotives once hauled massive log trains through the Sierra Mountains. Sent in by Rich Lundberg, this tip describes using a slitting saw mountinged on a lathe's toolpost to cut a groove on stock mounted in the lathes headstock. Sent in by Bernie New who found this link useful in learning about silver brazing. Recommend by Rich Lundberg, this application allows an earlier unmodified operating system & its environment like XP to run on a special environment on top of a current PC or mac operating system like System 7 at near host speed. For those using or are thinking about using Propane to power their steam locomotives, here is a starting link providing some general information about this interesting fuel. Live steam and locomotive supplies for 3/4", 1", 1.5" and 2.5" scale including trucks, whistles, injectors, lubricators, blowdown valves, water gauges, water treatments, books and steam oil. 4.75", 7.5" gauge steam locomotives, rolling stock, accessories and parts. "Our company has industry leading experience in pattern making, industrial archeology, 3D CAD design, rapid prototyping, 2D CAD, resin casting, restoration project management, and much more. Our hands-on experience goes back over 20 years!" New owner Steve Alley now supplies Gene Allen plans and parts for 1.5" scale Wabash mogul, Chloe plantation engine, ten wheeler, consolidation, Fitchburg Northern and others. Silicon mold making rubber & urethane casting resins. nuts, valves & MTP fittings, oilers, grease cups, unions. Noteworthy is the supply of model hex bolts/nuts. BHJ Bay City Screw & Bolt Co.
A hard-to-find source of fasteners used by Ken Brunskil. Similar to Bowlin Equipment of Berkeley, California or Harrison & Bonini or R.J. Leahy Co. of San Francisco, California. Highly recommended by Rich Lundberg as a hard-to-find source of fasteners. Similar to BHJ Bay City Screw & Bolt Co of Newark, California or Harrison & Bonini or R.J. Leahy Co. of San Francisco, California. "1.5" - 1' Narrow Gauge Scale Detail Parts For the Discriminating Live Steam Modeler." Foundry Supplies for industry and hobby . freight cars, trucks, couplers, rail & railroad building supplies." Clecos and cleco accessories (sheet metal clamps). 1.5"/1.6" scale locomotive, trucks, cars, rail, rolling stock. Used and recommended by Bob Cohen, this is a company who has three generations research on toolholders and have licence of import & export from Wuhan China Bureau of Commerce. Fine quality, competitive cost & great service. "I sell kits for 1.5" to the foot through 1.6" to the foot scale live steam models. Each kit comes with unmachined castings, drawings and specialty components. Kits include cold water pump, heater tops, hot water pump, Alco power reverse gear, butterfly fire door and air compressor dummy. " Live Steam & Diesel Model Railroading newsletter. Very similar to the offering of PM Research. Parts and components for the stationary engines and live steamers. "We specialize in miniature hobby screws in metric and standard sizes and have a wide variety of materials from anodized aluminum, stainless steel, plated and alloy steel screws to nylon and titanium." The Fastener Superstore is your one stop shop for nuts, bolts, washers, rivets, standoffs and more! We have everything you need right here. "Virtually perfect replica casting of internal and external forms with flexbar Reprorubber, the Flexbar Tirga-bore, Flexbar Posiitioning System and the Flexbar Visorguard ." Locomotive class lamps/flags rotating caboose marker lamps, tender marker lamps 1.5" scale, electric style, assembled and ready-to-use, 12 volts. to anyone making parts, patterns, tools or molds." "Gorilla stocks stainless, aluminum, brass, copper, cold rolled, alloy, and mild steel in tube, sheet, plate, bar and pipe. We can source any hard to find alloys for you as well." Sapon-A-max steam cylinder oil, PB&J220 pin, bearing & journal oil. "Since our inception in 1983, Grizzly Industrial®, Inc. has grown into one of the largest machinery companies in the United States." "Quality tools at ridiculously low prices and the largest tool and equipment retailer in the U.S.A."
Used by Anthony Duarte, they described themselves as: "Since opening its doors Hoosier Pattern has seen continual growth in the pattern making business. Known for its reputation of quality workmanship and commitment to 'On Time Delivery,' HPI has gained recognition as a premier pattern shop." "We're more than just metals; Service first, since 1941." 1/4", 1/2", 3/4" and 1" scale castings. "To provide the practical live steamer operating accessories that are realistic, dependable, and cost effective." "The premier source of tooling, parts and accessories for bench top machinists." Useful products for the live steam hobbiest. Email them to find out what is available. "Live Steam Locomotives is your hobby supplier for precision 7.25" - 7.5" gauge locomotives, including the Union Pacific Challenger, the only articulated live steam model on the market. We also have an extensive collection of reproduction locomotive and tender drawings from railroads of the live steam era." traction engineering capability for today's enthusiast." Globe and angle steam valves, boiler check valve, whistles, sight glass, whistle, blow down valve, lubricator, mogul tender kit. "This site is designed to inspire you to get started casting just like in a foundry." 2.5" scale C 16, 2-8-0, 0-4-0, 30-ton Davenport switcher and some 1.5" accessories. Many stationary and tool castings such as the Quorn, stationary pillar, die filer and strong arm shaper and many more. "490,000 products for your business and hobby." Machine-it-yourself kits for a wide variety of lathe accessories, primary to fit the 9"-10K South Bend lathes. Detailed drawings and clear instructions included with each kit, as well as fast, friendly service from owner Andy Lofquist. Items include flat cross slide with T-slots (also one for the Atlas/craftsman lathe), milling attachment, and other toolings. Projects include a small diesel model and filing machine. Metal Supermarkets is the world’s largest supplier of small quantity metals. of manufacturing reasonably priced 1.5"
and manufactured our way into becoming a large supplier of 1/8 scale train products." "MSC Industrial Supply is one of the nation's largest direct marketers of a broad range of industrial products to industrial customers, satisfying their maintenance, repair and operations (MRO) supply requirements." "We supply 1.5" scale, electric powered, diesel locomotive models, power trucks, and accessories for the large scale backyard railroad hobby, AKA the live steam hobby. We primarily model locomotives built by the Electromotive Division of General Motors Corp. though many of our parts and accessories may be used to model diesel locomotives built by other manufacturers. the foot and to a track gage of either 7.25"
"Naylor Steel has been serving the Bay Area since 1957! We are a customer service orientated company where the customer comes first. Al Naylor and his son Richard Naylor started a second hand store at 941 W. A Street in Hayward CA selling used tools and machinery. The company saw a need for small amounts of steel. The business took off and began to grow. In 1989 Naylor Steel moved to our current location and has been serving the Bay Area ever since. Richard's daughter Lori Naylor joined her family business in 1988." time or resoures to build it themselves." "The most complete resource for miniature railroad enthusiasts in the Northwest". Supplier for the Accu-Tie Rail System, Turnout & Wyes, Railroad Tie Plates, Cross Buck free-standing signal. "Ball Turner and other hard-to-find tools"
Located in Colorado, PlasmaCAM, Inc. specializes in making this one CNC plasma cutting machine. Design of the revolutionary PlasmaCAM cutting system begain in 1994. It quickly became the world's best selling automated plasma cutting machine. Passenger cars in 1.6" scale. "Patton's has four divisions, Steel, Industrial Tools and Machinery, Ornamental Supplies and Office Furniture." Pocahontas Live Steam coal is $15.00 for a 50 lb bag plus shipping. "Custom boilers to your blueprints." Battery powered 7.5" gauge box electric locomotives including battery powered DRG&W Goose kit. 1/8 Scale Train Car Kits and Accessories. on CD, provide the dedicated modeler or railroading fan with hundreds of pages that are filled with scaleable high-resolution images and searchable text." Model gas powered speeders, wheels, cars, train parts. "We specialize in Live Steam Locomotives and Accessories for the Live Steam Hobby." This is the link to the LS Manufacturing mentioned on the nelsonslocomotive.com web site. largest stockist of model enginering supplies." Marty Knox offers the live steamer complete boiler services including design, build, inspect and repair. Builders of custom steam whistles. Brass and copper sales, fasteners of all kinds Contact Karen or Russell. Suggested by Michael Smith. R.J. Leahy is similar to BHJ Bay City Screw & Bolt Co of Newark, California, Bowlin Equipment of Berkeley, California or Harrison & Bonini or R.J. Leahy Co. of San Francisco, California. 7.5", 12", 15" gauge steam, propane, gas-powered locomotives, rolling stock, accessories, parts, tracks, signals and miscellaneous items. Signals & Structures, all scales, all types. 1.5" scale castings for class 'B' 2-truck or class 'C' 3-truck shay. Slater Tools Inc. offers the largest variety of internal and external rotary broaches, also known as wobble broaches. tank cars, box cars and cabooses. SteamCad is a collection of free AutoCad© Line Drawings of steam locomotives and tenders. time to time be incidental and conducive to the attainment thereof." Bettendor Trucks for 7.25" or 7.5" gauge track. "Taig Micro Machines and Accessories"
3/4" Scale Raritan drawings and casting. Propane ring burners for the firebox of boilers. Found by Rich Croll, who was looking for a device to help him rerail a derailed locomotive, they sell a 2.5/5 ton hydraulic Toe Jack which seems ideal. Very substantial & heavy duty, the price seems quite reasonable. Much better than a scissors jack. "With more than half a ton of iron behind it, the PNCN 1100 Series 3 has the precision and rigidity you need. Whether your work requires milling intricate linkages, heavy casting or complex 3 dimensional reproductions, this 3 axis CNC mill is ready when you are." Mitee-Bite 5C Collet Stop Model #10105, Order number 69-600-020; $27.49 for a 24” long piece. Used by member Loren Byron to cast a production run of tractor tread shoe plates, this is a "Manufacturer of Steel, Stainless Steel, Aluminum and Cast Iron castings. We specialize in castings ranging from 1oz. to 100lbs. Some of the services offered; Machining, Heat Treating, Plating, Painting & Testing." They don't do "one-offs", so this might not be something that a live steamers could utilize.